Dental bonding, also known as composite bonding, provides the opportunity to restore the surface of your teeth permanently, without needing to resort to invasive procedures. Ultimately it’s a very convenient procedure that can restore your sense of self-confidence, and is often performed in the chair. Your dentist will recommend bonding if you would like to improve the appearance of your teeth. 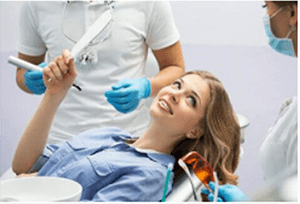 Our friendly dentists in Point Cook use bonding on teeth that have been chipped, discoloured or cracked, and has also been used as a replacement for silver amalgam fillings. At Infinite Dental Point Cook our dental bonding procedures are efficient and painless. We apply a highly specialised tooth coloured resin to the surface of your teeth in layers. The layers are bonded to your teeth by UV light; a process that enables us to recreate the exact size and shape of your tooth. Composite bonding is considered conservative because it doesn’t change the tooth enamel very much. Our specialised dentists use dental bonding in for different minor reconstructions. Tooth decay | The resin used in composite bonding is ideal to fill cavities, and is used as a replacement for amalgam or metal fillings. Because the resin is tooth-coloured it is hardly visible. It also feels more natural than metal in the mouth. Damaged, cracked or chipped teeth | Composite bonding is used most frequently to correct chipped, cracked or damaged teeth. For protection | If you have receding gums that have exposed part of your tooth’s root, composite resin can be used to cover it up. Closing gaps between your teeth | If you have diastema or gaps between your teeth, bonding can be applied to close them up and give you more confidence when you smile. Reshaping teeth | Bonding resin can also be used to change the physical appearance of your teeth. Your Point Cook dentist may use it to make your teeth wider or longer, or to change the shape of your teeth. Restoring colour to your teeth | Your dentist will customise the resin to match the colour of your teeth. If you have discolouration composite bonding is an option to cover it up. Composite bonding can last up to 10 years if you take care to avoid hard substances that could crack the resin. It’s not as hard as your tooth enamel, and could also be stained by substances like tea, coffee and caffeine over time so regular check ups and good dental hygiene is essential. Some cases require anaesthetic, while other procedures can be performed without it. Your dentist will explain whether you will need anaesthetic or not. Your tooth will be prepared by thorough cleaning. It also has to be completely dry. This is to ensure that no saliva is present, as this can affect the integrity of the composite resin. The surface of your tooth will be prepared by sanding it a little, and then bonding adhesive will be applied. The resin will be applied, layer-by-layer until the desired effect is achieved. Once the surface has been polished, you’ll be able to go home. give us a call at (03) 9395 8400, and let’s book an assessment for you.